A nearly intact Wooly Mammoth skeleton has been unearthed at a construction site near the famed La Brea tar pits in Los Angeles, California. 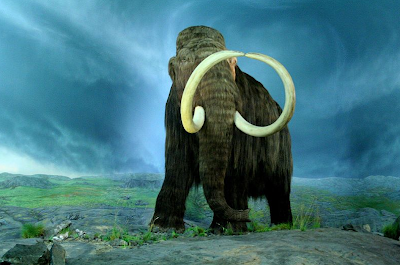 Historically, the tar pits have yielded between 3 and 4 million fossilized remains over the years, but the discovery of the Mammoth remains is being described as one of the most significant finds in more than a century. Especially exciting, is the fact that both of the Mammoth’s tusks are so astonishingly well-preserved. Speaking of well-preserved: as mentioned in the headline, legendary funny-man Jerry Lewis was honored at the 2009 Academy Awards Ceremony. Here at the Museum, we’ve always been fascinated by the octogenarian comic-genius’ jet-black hair, and the adulation heaped on him by the French.